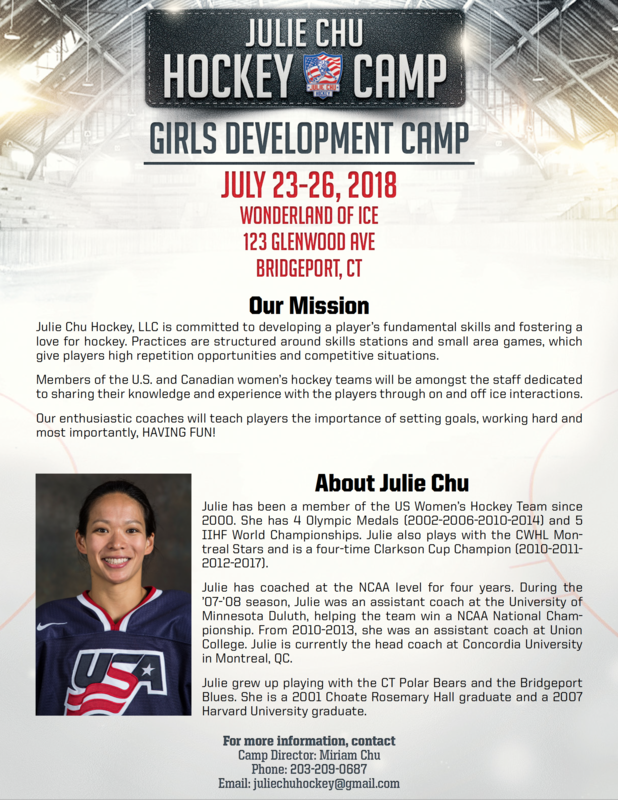 Julie Chu Camp 2018 | Connecticut Girls Hockey League, Inc. I wanted to share a great opportunity to attend a very special Summer hockey camp. Professional Player and Repeat Olympian / Team USA Captain, Julie Chu, will offer a Camp again this Summer at at Wonderland of Ice, Bridgeport, CT.
For those who may be unfamiliar with Julie, she’s a Connecticut native who grew up in Fairfield/Bridgeport, played for Choate and Harvard University, won the Patty Kazmaier Award (best female collegiate hockey player) and helped Team USA win World Championships and successive medals at the Olympics (in '02, '06, '10 and ’14). She also plays professionally and has been a repeat all-star! It's so important for all athletes to connect with inspiring role models / heroes and Julie Chu is a great one! Julie is widely respected for not only being a phenomenal player, but also an inspiring leader! In addition to her on-ice sessions, Julie offers motivational chalk talks which get incredibly high reviews! My daughters were able to attend her summer camp and they absolutely loved it! Who: Open to all U10 – U16 currently on travel teams with average or better skating skills. How Many: Space is Limited … Groups will be kept to 40 players and 4-6 goalies. First come first serve. Good luck and Go Girls Hockey!